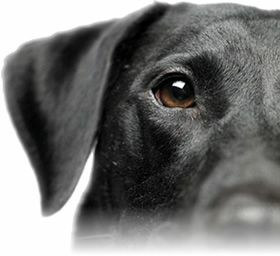 Mold Dogs - Why Dogs? The Nose Knows Best | 1-800-GOT-MOLD? 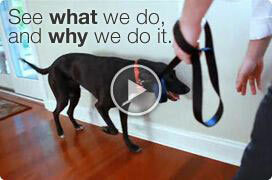 Why Dogs? The Nose Knows Best. Mold is a symptom of excess moisture. Unfortunately, mold and moisture problems often go unnoticed for long periods of time. It's not because no one cares. It's because mold and moisture problems rarely show their ugly heads until they are well on their way down the path of destruction. By the time a mold problem becomes visible, what you see is often just the tip of the iceberg. Modern construction methods and materials can make moisture problems difficult to detect. Some building materials trap moisture, while others offer the nutrition mold needs to grow. Mold growth is often hidden away, out of sight. One would have to have x-ray eyes to find most of these problems in their early stages. Even if the air sampling results show high spore counts, you still do not know where the source is located or how widespread it is. Another mold inspection would be needed to locate the source, and that inspection would likely be invasive and destructive – cutting holes in walls for example. According to the Institute of Medicine’s study on Damp Indoor Spaces and Health, certain types of molds, such as the dreaded “toxic mold,” Stachybotrys, create very few spores and/or sticky spores, which do not become airborne or stay aloft easily. This can prevent them from showing up in routine mold testing done during a typical mold inspection. Also, mold spores within a wall do not easily make it out into the occupied space in large quantities. Therefore, normal levels may be found through air sampling while a significant problem rages unseen inside the walls. The gases mold produces are detected by the human nose as a “musty smell.” In addition to producing an unpleasant odor, these gases are known health hazards according to US EPA and other authorities. Chemicals such as benzene, a known carcinogen, are routinely found coming from active mold colonies. Unlike spores, gases can easily penetrate walls and build up indoors, creating discomfort and causing health complaints such as headaches, nausea, dizziness and fatigue. While this seems to complicate things, the gases themselves are the key to the solution. Dogs have been trusted for hundreds of years to detect and locate things that humans can’t find. Since 2003 we have been using specially trained mold detection dogs (Mold Dogs™), trained just like bomb dogs or drug dogs, to detect and locate the source of mold growth by detecting the gases mold growth gives off. Mold Dogs give us the ability to quickly and accurately screen a building for hidden mold and moisture problems non-destructively. Once we use our four-legged mold detectives to help us locate the areas that need further investigation, we then use infrared thermal imaging, laser particle analysis and industry-standard laboratory testing to confirm the dog’s findings. Call us today at 1-800-GOT-MOLD? (1-800-468-6653) on a confidential basis. See what 1-800-GOT-MOLD? can do for you.